So I've got a new blog format to go along with my resolution to write more... it's very Easter-ly. All things being made new. My thoughts today come from my Preaching class with Darrell Johnson. He talked about preaching the book of Revelation, and gave us several tips for interpreting and explaining the book. He actually wrote a book about it called "Discipleship on the Edge," which I haven't read, but I want to, after learning so much in today's class. Some of it I had heard already... like the fact that we need to honor the book's genre, as a letter (which was written to a particular people and had meaning to their present-day situation) and an apocalypse (which means "unveiling" or "breaking through" - the disclosure of the unseen realities of both the future and the present, drawing out implications for today.) It is the Revelation of Jesus Christ, about Jesus Christ, by Jesus Christ, and any interpretation that doesn't lead to an encounter with Christ (eg. by getting bogged down in dates, or in fear-mongering) does not match up with the purpose of the book. There is a lot of symbolism in the book (let's hope we don't go to meet Christ and discover an actual lamb with 7 eyes and 7 horns! ), and this also applies to the numbers used. The most eye-opening realization about the book that I heard today is this: John saw these visions in a certain order, but this doesn't mean they're in chronological order. It doesn't seem like he was concerned with chronology at all (a characteristic which I've also seen as I've studied Genesis in Iain Provan's class). The book feels jumpy and disjointed, moving from mass destruction to throne-room worship, to what seems like an ending, but keeps going... Darrell likened it to an MTV music video, with rapid cuts and little continuity. One minute, Jesus is holding 7 stars in his right hand (1:16), and the next, he's placing his right hand on John (1:17). It makes a lot of sense to me to approach the book with a view of unpacking the images, and letting them take their places, without trying to impose a chronology on them. 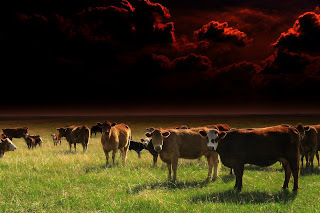 In closing, here is a picture of cows that I apocalypt-ified.